Check-in 2:00pm, check-out by 10:00am. Payments by PayPal, bank transfer are all welcome and can be paid in full or 6 weeks before arrival for your holiday you may also pay in instalments. Please note if you use PayPal to choose send to a friend option so that you don’t get charged from your payment. An addition £50 deposit is required to secure you booking, this is additional to the hire price and will be held as a damage/security bond. Your deposit will be returned within 10 days after departure and full inspection. 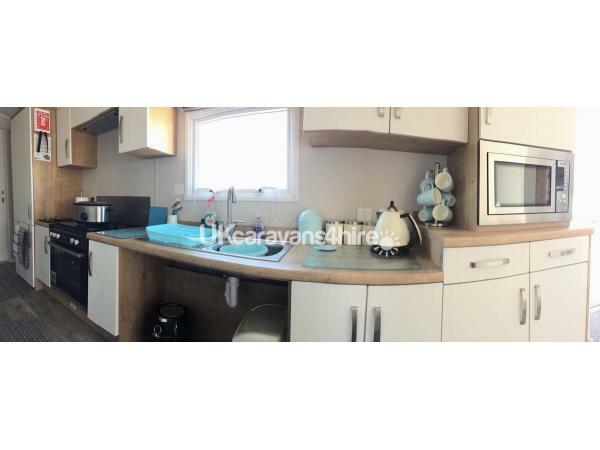 We do ask all customers to please leave the caravan clean and tidy as you found it on arrival. 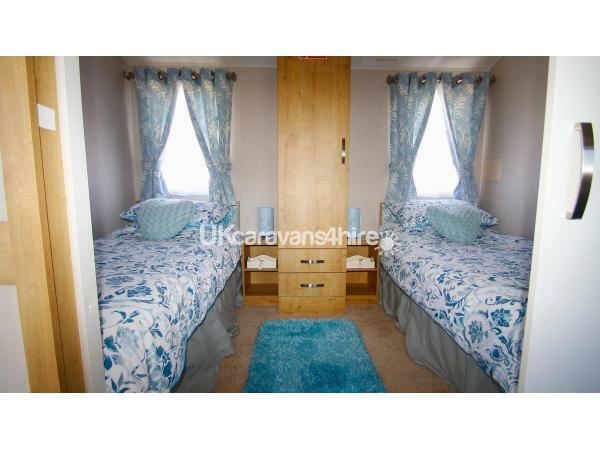 The deposit is non refundable should you cancel your holiday, or any damages are made, stains of any kind big or small or found to have had pets in the caravan. When enquiringly please state how many adults, children and infants or wheelchair occupant. This is so we know what we need to provide for your stay. 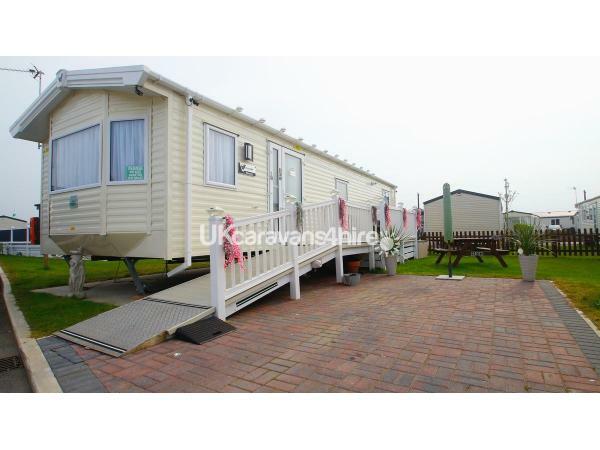 You are looking at a brand new 2018 Willerby Richmond caravan suitable for all families to a maximum of 5. 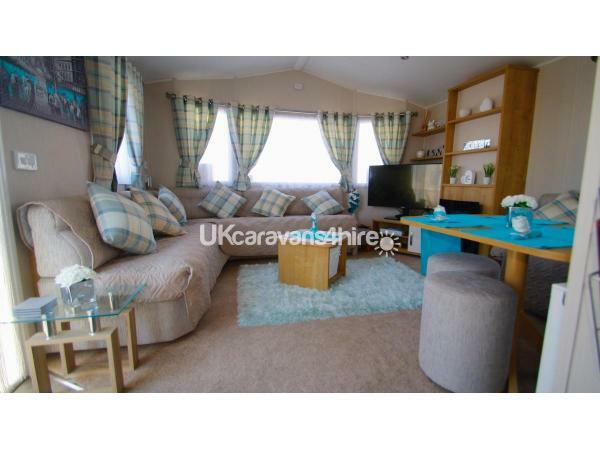 In the lounge we have a lovely in built seating area with lots of space and dining seating, Also in the living area we have a 43” TV with built in free view and a separate DVD player. Our kitchen has a modern feel with lower worktops for disabled, low oven, low microwave and fridge freezer we also have a acti-fry for our customers to use during there stay, let’s not forget the usual essentials of a kettle and toaster, please note using to many appliances at the same time can trip the electric which you will need to either contact someone on site to get back on or you can do it yourself. Instructions are in the welcome folder I have put together for customers to have a read. If you do contact someone on site please be aware that you may need to wait as they are quite busy all year round. The kitchen also has a fire blanket and extinguisher in case of a fire along with instructions of what to do during a fire event. Our twin room includes 2 full size single beds with 2 small bedside tables with a lamp on each and a wardrobe. We also have a 24” TV. The master bedroom has a beautiful Queen size bed And a full size single bed, this room is very spacious and also has wardrobe space and a helper frame for those who require it. Also includes a 24” TV. 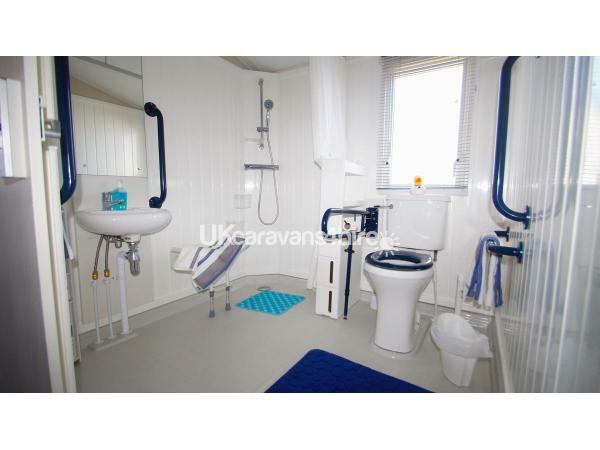 The bathroom has a walk in shower and as mentioned above hand rails and a seat in the shower for those who need the extra support during there stay. There is also a drop down handle next to the toilet which requires pulling upwards in order to drop down. 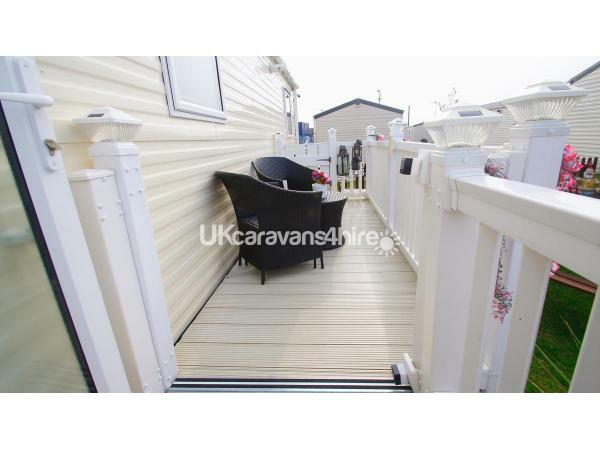 Our caravan has ramp access with a newly added veranda extension for those hot summer days for you to enjoy the sunshine. We do politely ask our customers to not have chocolate or sweets in the lounge area and on sofas to avoid sticky mess and extra cleaning after your stay. 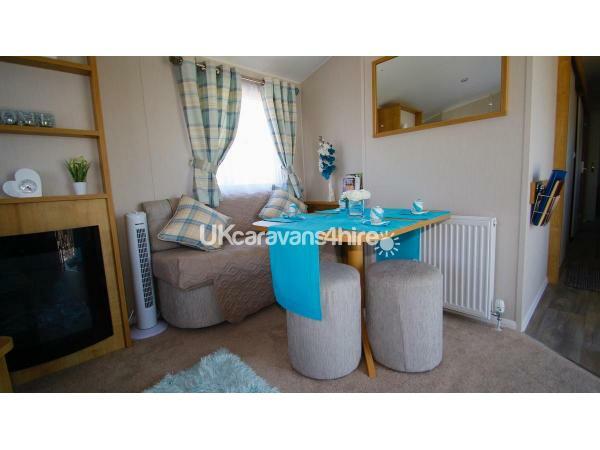 We also don’t permit the use of any kind of felt tip pens or markers in our caravan. Any damages little or small will result in loss or your £50 deposit bond in order to replace or fix anything. We have a strict no pets and no smoking policy, this includes e-cigarettes. 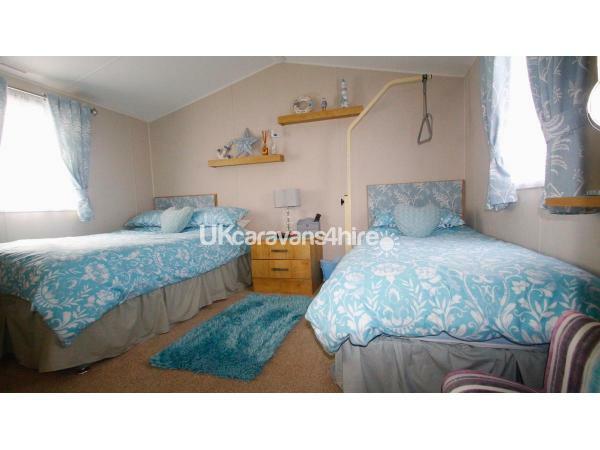 We ask that all customers to please treat our caravan with the same respect you would your own home and keep it a clean as you found it on arrival. We also supply a travel cot and high chair if required during your stay, just inform us if you have an infant and these items will be ready for your arrival. Check in time is 2pm - check out time 10am. Payment is flexible but must be paid in full 6 weeks before your arrival date, once your payment is paid in full you will receive a confirmation email with check in instructions. Please check your junk mail or add sbgoldengate@outlook.com to you email contacts. A contact phone number is on this ad as well but please be aware the owner is partially deaf and find it easier via text message rather than phone call to deal with enquiries. Perfectly located, it’s within walking distance of all local attractions, shops and gift shop including one of North Wales largest Tir Prince with over 400 stalls, family friendly pubs, clubs, arcades and many more. Surrounding areas included some great places to visit during you stay including Welsh Mountain Zoo, Snowdonia, Conwy castle and many more, you will find information on some of the days out in our welcome booklet/folder.